Sometimes I listen to people describe life with pets in their household and it sounds like pure chaos! They go to great lengths to keep the dog away from the cat, the toddler, the hamster, the guests, and who knows what else. They live life skillfully orchestrating mealtime, walks, and family time like it's a stealth mission. Does this sounds like your household, or the home of someone you know? Want to get back some sanity? Well, let me introduce you to the all powerful LEAVE IT! command. When we first got Icy she was about 14 weeks old. She was your typical rambunctious puppy, getting into everything and curious about everything and everyone. The everyone included Maggie, our senior Calico cat. Maggie was 14 years old at the time and the only pet in our home, when this bull-in-a-china-shop puppy came barreling into her peaceful life. Needless to say, Maggie was NOT amused. Icy was enthralled with Maggie from the moment she laid eyes on her. All she wanted was to play with the little furry toy that moved all by itself! She wouldn't leave poor Maggie alone. Icy was getting bigger by the day and things quickly spiraled out of control. They couldn't be in the same room without Icy desperately trying to chase after Maggie and Maggie skittering away from her like a bat out of hell. All we wanted was for Icy and Maggie to co-exist peacefully. We wanted to watch TV in the family room together without Icy bothering Maggie. Was that too much to ask? Our PetSmart trainer, Ricky, introduced us to the Leave It! command and it changed our lives! It took time and effort, but we finally got to the point where Icy would leave Maggie alone. The first time we all sat in the living room together watching TV, with Maggie on the couch and Icy laying peacefully on the floor beneath her was a joyous moment indeed! From then on we all lived happily & peacefully together. What a relief! The Leave It! command can be useful in getting your dog to leave another pet alone, such as a cat or hamster, leave your children alone, and not lunge at guests when they enter your home. It's useful when food drops on the floor, if your dog spies something unsavory in the street, or if they spot an animal in the yard or another dog on a walk. When Icy was a puppy, she spotted an apple core in the street on a walk and grabbed it. She began to choke and my husband had to reach in and get it out of her mouth. Now we use the Leave It command whenever she sticks her nose where it shouldn't be during our walks. We use it when walking by other dogs as well to ensure she ignores the other dog. > Start with treats. Keep your dog, preferably on leash, about 4 feet away and drop a treat on the floor. > As the treat falls to the floor, firmly say "LEAVE IT" ! > When your dog lunges for the treat say "AH, AH!!" and cover the treat with your hand. Your dog will likely try to get it out of your hand but firmly say AH, AH! (or NO! if you prefer) and don't let him get the treat. > When he finally stops trying to get the treat, mark that behavior with a YES! or Click if you use a clicker for training. > Reward the behavior of not trying to get the treat by giving him a treat. Ideally, you should treat with another treat rather than give up the one you dropped on the floor. > Keep repeating this, dropping the treat closer to the dog as he progresses by leaving the treat alone. > Keep practicing until your dog gets it and doesn't lunge for the treat you drop on the floor closer and closer to him. > Practice by dropping treats on the floor in a line and walking your dog past them, while he's on leash so you can keep control. Give the Leave It command as you start the walk, say it again if needed. Reward him for not trying to grab the treats on the floor with a treat at the end of the line. If you need to pull him away to keep him from lunging for the treats that is NOT success. Don't reward him for that, just keep trying until he learns to leave the treats alone and not try to grab them. > Ultimately, you should be able to place a treat on his paw while he's lying down and he won't try to grab it when you give the Leave It command. Be sure to give the command really early, right before you place the treat on his paw or as you place it on his paw. Be prepared to grab the treat away the first couple of times until he learns not to try to get the treat until you let him know he can take the treat. Give him the OK or Take It command to let him know that now he can reach for the treat on his paw and savor his success! > Once he gets it reliably, progress to training Leave It with other objects like toys you walk him passed on leash and a toy you toss in front of him. There are so many reasons to teach your dog to Leave It! We use this command constantly. This is what makes Leave It! one of my favorite and most useful obedience commands. Have you used the Leave It command? Tell us how it's helped your dog. If you haven't taught it to your dog yet, could the Leave It! command help you restore some peace in your home? Leave us a comment, we always want to know what you think! Good for you, Lily & Edward, you are so well behaved! Thanks for visiting us today! Oh man oh man!!! The leave it command is like gold is my house! With 3 huskies and 3 cats....yep! Thanks DOG for the leave it command! Thanks for joining our special pet parade anniversary hop! Oh wow, good thing you taught him that life saving command! It's so important. Thanks for hosting this Pet Parade Pawty & blog hop! Hi - Love this post on the "leave it" command. As a dog trainer I teach this command as a safety command much like the emergency recall. The reason I have alway done this is from personal experience. I think one sentence will tell you the whole thing. One day, I dropped a glass jar of spaghetti sauce on the kitchen floor. The rest is most likely apparent. I am just glad that I had trained my dogs the "Leave It" command or there would have been a definite rush to the emergency vet had one of them tried to enjoy shards of glass "a la sauce" for dinner. The "leave it" command can be used in so many instances. Yes you can have a more harmony in your house, but it can also save your pets life. Thanks for the reminder of such an important command that all dog owners should have in their arsenal of commands. Wow, that could have been disastrous! Thank you for sharing that great example of the benefits of the Leave It command. Thanks for visiting us today! What a great post! I would have panicked with the apple incident! Leave it is such an important command for all dogs to know. Thank you, I'm glad you liked it. I would have panicked too, but thankfully my husband was very level headed about it! He just reached in & yanked the apple core out of her throat. It's a command that could save your dog from injury or much worse! Great tips and am going to pass them on to a friend of mine who is having problems with her pup. Thank goodness leave it was the first command Layla learned as we live in the city and with the garbage on the streets I had to to do it. I'm so glad Layla knows this command, it is important especially in the city - you never know what's on the streets! I hope it helps your friend too. Great post and it definitely can cut down on a lot of the chaos. The reason I taught Jack to leave it is because he loves to scrounge around for food on our walks, and unfortunately there's always something for him to find. That command can be the difference between a nice and enjoyable walk or coming home with a bout of pancreatitis!! Thanks Hindy, I'm glad you liked it. Oh yeah, it's so helpful on walks. Dogs love to get into everything, sticking their noses where they shouldn't! I need to work on this with Theo. It's so helpful in so many areas. It could actually save Theo's life one day if he manages to get hold of something toxic or something he can choke on. Totally giving this a try! Our issue isn't so much that the cats do not want to play with my new live in granddog Link, they DO want to play! Then of course, as cats are, they get tired of playing and then the troubles begin. Even when the cats DO want to play sometimes mom here gets annoyed. It can get crazy loud and rambunctious! LOL I love that they play and get along for the most part but I work from home so sometimes I cry SANTIY NOW! LOL!! 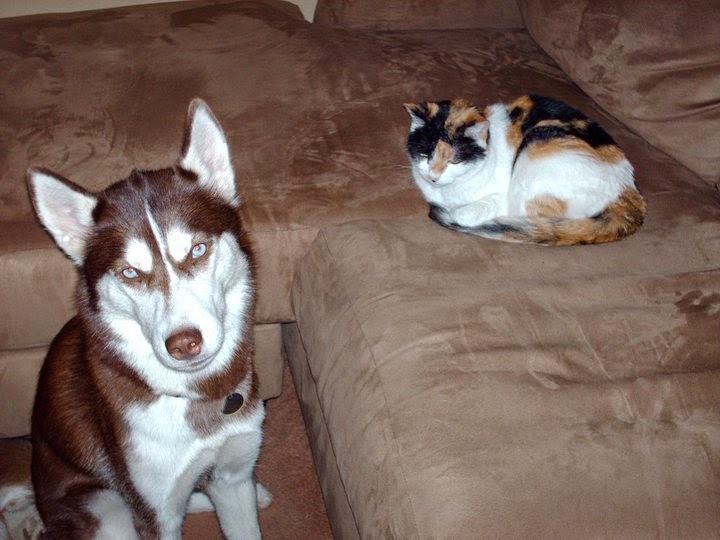 I am lucky all our pets get along well - except for Lyla, she is old and cranky, like me. She just growls at the others while they play. Link has got his nose scratched a time or two though. The cats have limits! I will try training Link AND the cats the Leave It command! I'm so glad they all get along & play together, that's such a blessing. But the Leave It command can help keep things from getting too nuts! In an interesting twist, when I first taught this command to my black lab, I also had a toddler. My son (now in his 30's) learned the "Leave It" command as well simply because he watched me train the dog. It came in very handy as a way to warn not only the dog but my son away from anything dangerous. LOL, I love that!! What a great story, I would imagine that was so helpful with your son as well, keeping him away from potentially dangerous things or situations. Well done!! Leave it is my favorite command and is used daily in our house. Especially for Beau as if there is trouble he will find it. He's even eaten business cards off the coffee table! It's definitely one of my very favorite commands too. It's so helpful to not only keep the peace in the house but also keep them away from potential dangers anywhere. Beau sounds like quite a character - he ate your biz cards, huh? Hmmm, perhaps there's a hidden meaning in that - maybe he wants you to play with him more and not work, LOL! We're still mastering "leave it". Our little guy has selective memory on what to leave and what to take. Anything edible he thinks is for the taking. It's a lifelong learning for us and him. Stick with it, some things take more time than others. Hopefully everyone in the household is being persistent. This is a good training tip. I can see how it would be very helpful in situations like keeping the peace like you mentioned as well as around guests at holiday time. Very helpful. It's definitely one of the most useful commands I've taught my dogs. It has a lot of safety implications. Thank you for this refresher. I definitely want to work more on "Leave It" - it's such an important command that sadly my dogs have become more lenient to. - Shelby G.
Thanks Shelby! It's always good to take time for refresher training. We have used Leave It continually to make sure they don't lapse. Same thing with their emergency recall, I practice it every few weeks or so to ensure it sticks but doesn't get boring for them. Good luck with Leave It! I think the leave it command and the wait commands are the best! They have helped during dog walks when we find food and when we have guests over for a party. They're both such critical commands! Great ones to practice before company comes for the holidays too. These two along with our emergency recall command are the most important ones for us. Your instructions for Leave It are exactly the way I taught them to puppies in class. I have had my new puppy in classes with a number of different trainers and the Leave It command was only slightly mentioned...thanks for the reminder so that I can reinforce this training now that Gusto is older. Oh definitely re-enforce training this command, I think every trainer should include it in their puppy courses. I love success stories where people can work with their animals so everyone gets along. I don't think I realized you had a cat! I'd love to hear more about her. Leave It is one of the indispensable cues to teach (and practice). Personally I find it is also important not just to teach the dog what it means by also teach yourself to actually use it! I totally agree Jana! It's one of those critical command. You're right, it's super important to know how and when to use it and to remember to use it! What a great way to get your pets to behave! I've never thought to use the command that way. Dolly refuses to obey that command, but Taffy has learned to, as a canine garbage disposal, if I see her going for something she'll leave it alone, that and drop it! I don't agree with people using leave it when walking by another dog though, do you? Dolly is so funny, she's got a mind of her own that one, LOL! I'm glad Taffy has it down though. I do use it sometimes when walking by another dog especially when Icy and Phoebe are together. Phoebe gets a bit too brazen when Icy is with her on walks - she thinks she can be all big & tough when her Husky sister is with her, LOL!! When one of them seems a bit too interested in an approaching dog I often use it. I don't like them greeting strange dogs in the street, we've had some bad experiences in the past with nasty doggies! Babu has not ben formally trained to do anything but he is generally well behaved unless it comes to cats. Being an only pet has spoiled him. It's great that he has good manners, that's so important. It might be worth teaching him the Leave It command so he doesn't chase or bother any cats! Leave it is a fantastic command. We use leave it or a loud "Ah Ah" as we learned from Victoria Stilwell. It is so important for dogs to know this and I am glad you shed the light on it. Tweeting this now! We've used it so often over the years with both our dogs, it's valuable in so many different situations. Thanks for sharing, I really appreciate that! What a great post! I taught Magic the "drop it" command, which essentially handled things AFTER he'd put stuff in his mouth (or to relinquish a toy). I've also used "wait" command to stop 'em in their tracks. I have never heard of that command and it is very clever. Layla thank goodness lives alone with me and is very good about not getting into things excluding shopping bags as she thinks those are hers with the food inside LOL, but when I say to her no she normally backs away, and I give her a treat. I will try this command now and see if she will learn in and see what happens. I love the leave it command! I once had a puppy and a bunny and fortunately they grew up together and became great friends. The 4 lb. rabbit was the alpha over the 50 lb. dog! Yes, the leave it command really does work and helps a lot on walks when Hiccup wants to eat scraps of food he finds along the way. A pet peeve of mine is when people throw chicken bones on the street. They have no idea how dangerous this can be to dogs. I'm sure that this phrase have saved a lot of dogs and their people heartache! I need to work on it with my dogs, thanks for the tutorial! Leave It is one of the most important commands one can teach. It can literally be life-saving. Kilo chased Nala aggressively when we first started fostering him. She was 19.5 with kidney disease so I just had to keep them apart. She taunted him as she was used to our previous respectful dogs. We have worked on Wait, No, walk by and Drop It and have had some success as long as Kilo sees payment or does not panic- I still wouldn't trust him 100%. He is very resourceful finding food he shouldn't and grabbing or lunging at things so we'll keep working on it. We used the same command to teach Misha to co-exist with our cats too! She wasn't trying to chase them in a negative way; only wanted to play with them! Our cats did not appreciate being chased! This command definitely helped! Now 2/5 of our cats allow Misha to actually sniff/lick them! The other 3 still prefer to be left alone. Sounds like a command all dogs should be taught. My mom’s dog never learned this command. He doesn’t always come, either.